evaluate a boy for possible surgery. 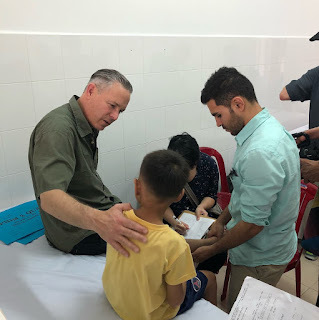 The day after we arrive in Vietnam, we immediately start work by evaluating patients for the first two days.The hospital pre-screens many of the patients so that our team is evaluating the most likely surgical candidates. We start by doing a short interview with each patient to identify what they'd like our team to evaluate, some basic history on the condition and previous treatment, and basic demographic details. 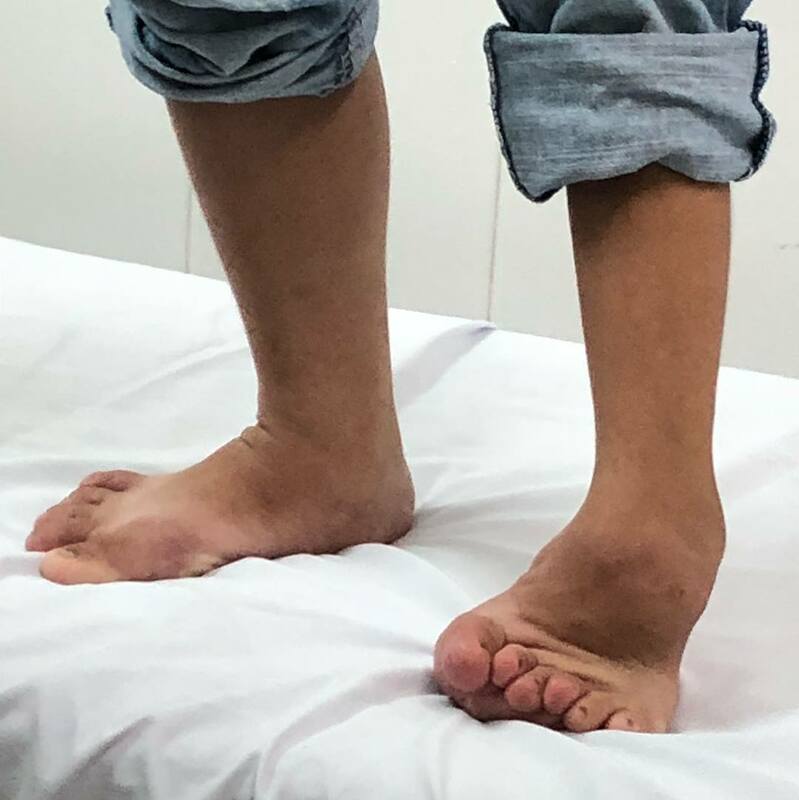 From there the patients move on to one of our team members who photographs and takes video of them to document their deformity, both for the doctors in the evaluation process, but also for information later. The doctors often use learnings from the missions to write papers for medical journals detailing procedures and specific patient cases. Once they've been photographed, the doctors evaluate each patient -- taking measurements, testing flexibility, and learning more about the patient's physical limitations. Using the information from the exam, the doctors identify whether the patient is a surgical candidate and what procedures they'll perform. Our translators are invaluable in this process, both in helping us to gather information, but also in helping to explain to the patients and families what our team is doing. In this trip, we brought team members from California to assist us with translation. Their understanding of the language and culture -- as well as American culture -- bridge the gap between our team and our patients. 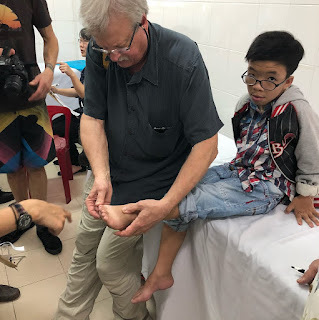 Dr. Jeff Spanko evaluates a patient with a foot deformity. As much as we'd like to help every patient we see, we're not able to do so. Some patients have a condition that cannot be helped with surgery. Others have adapted so well to their deformities over time that surgery would cause other physical issues, such as back injuries. On our first day of screening, we evaluated 37 patients and scheduled 26 for surgery. On the second day, we evaluated another 44 patients and added 20 to the surgical schedule. The patients who come to see the team range in age from 5 years old to beyond 80. Most of the conditions result from birth defects or illness (often polio), while others are caused by trauma. One of our patients had been shot in the hip during the Vietnam War and was still dealing with painful consequences. Unfortunately, our team was unable to help her through a foot or ankle surgery. The most difficult part of the screening process is when we have to tell a family that we are unable to help. Families arrive full of hope that we can help their child or family member with surgery. Some patients opt out of the procedure due to fear or the inability to be away from work for the length of time it takes to recover. Foot and ankle surgeries often entail lengthy recovery, which is initially very painful. Our patients must rely on family members and friends, especially while on crutches. Many will have procedures on both legs, which makes them even more reliant on others during the healing process. Our goal is to treat as many patients as possible in ways that will help them going forward. We want kids to be kids -- focused on playing and learning instead of dealing with physical challenges. We want to help remove limits by improving mobility for people who may not be able to fully participate in their communities. And we want to relieve discomfort and challenges caused by deformities. Having the opportunity to do this for the people of the Mekong Delta is what brings us back to Can Tho, time and time again.